The effect of both crop transpiration and soil evaporation are integrated into a single crop coefficient. The Kc coefficient incorporates crop characteristics and averaged effects of evaporation from the soil. For normal irrigation planning and management purposes, for the development of basic irrigation schedules, and for most hydrologic water balance studies, average crop coefficients are relevant and more convenient than the Kc computed on a daily time step using a separate crop and soil coefficient (Chapter 7). Only when values for Kc are needed on a daily basis for specific fields of crops and for specific years, must a separate transpiration and evaporation coefficient (Kcb + Ke) be considered. 4. calculating ETc as the product of ETo and Kc. FAO Irrigation and Drainage Paper No. 24 provides general lengths for the four distinct growth stages and the total growing period for various types of climates and locations. This information has been supplemented from other sources and is summarized in Table 11. In some situations, the time of emergence of vegetation and the time of effective full cover can be predicted using cumulative degree-based regression equations or by more sophisticated plant growth models. These types of models should be verified or validated for the local area or for a specific crop variety using local observations. * Lengths of crop development stages provided in this table are indicative of general conditions, but may vary substantially from region to region, with climate and cropping conditions, and with crop variety. The user is strongly encouraged to obtain appropriate local information. 1 Crucifers include cabbage, cauliflower, broccoli, and Brussel sprouts. The wide range in lengths of seasons is due to varietal and species differences. 2 These periods for winter wheat will lengthen in frozen climates according to days having zero growth potential and wheat dormancy. Under general conditions and in the absence of local data, fall planting of winter wheat can be presumed to occur in northern temperate climates when the 10-day running average of mean daily air temperature decreases to 17° C or December 1, whichever comes first. Planting of spring wheat can be presumed to occur when the 10-day running average of mean daily air temperature increases to 5° C. Spring planting of maize-grain can be presumed to occur when the 10-day running average of mean daily air temperature increases to 13° C.
3 The late season for sweet maize will be about 35 days if the grain is allowed to mature and dry. 5 Olive trees gain new leaves in March. See footnote 24 of Table 12 for additional information, where the Kc continues outside of the "growing period". Primary source: FAO Irrigation and Drainage Paper 24 (Doorenbos and Pruitt, 1977), Table 22. The lengths of the initial and development periods may be relatively short for deciduous trees and shrubs that can develop new leaves in the spring at relatively fast rates (Figure 23). The rate at which vegetation cover develops and the time at which it attains effective full cover are affected by weather conditions in general and by mean daily air temperature in particular. Therefore, the length of time between planting and effective full cover will vary with climate, latitude, elevation and planting date. It will also vary with cultivar (crop variety). Generally, once the effective full cover for a plant canopy has been reached, the rate of further phenological development (flowering, seed development, ripening, and senescence) is more dependent on plant genotype and less dependent on weather. As an example, Figure 28 presents the variation in length of the growing period for one cultivar of rice for one region and for various planting dates. The end of the mid-season and beginning of the late season is usually marked by senescence of leaves, often beginning with the lower leaves of plants. The length of the late season period may be relatively short (less than 10 days) for vegetation killed by frost (for example, maize at high elevations in latitudes > 40°N) or for agricultural crops that are harvested fresh (for example, table beets and small vegetables). High temperatures may accelerate the ripening and senescence of crops. Long duration of high air temperature (> 35°C) can cause some crops such as turf grass to go into dormancy. If severely high air temperatures are coupled with moisture stress, the dormancy of grass can be permanent for the remainder of the growing season. Moisture stress or other environmental stresses will usually accelerate the rate of crop maturation and can shorten the mid and late season growing periods. The values in Table 11 are useful only as a general guide and for comparison purposes. The listed lengths of growth stages are average lengths for the regions and periods specified and are intended to serve only as examples. Local observations of the specific plant stage development should be used, wherever possible, to incorporate effects of plant variety, climate and cultural practices. Local information can be obtained by interviewing farmers, ranchers, agricultural extension agents and local researchers, by conducting local surveys, or by remote sensing. When determining stage dates from local observations, the guidelines and visual descriptions may be helpful. Changes in vegetation and ground cover mean that the crop coefficient Kc varies during the growing period. The trends in Kc during the growing period are represented in the crop coefficient curve. Only three values for Kc are required to describe and construct the crop coefficient curve: those during the initial stage (Kc ini), the mid-season stage (Kc mid) and at the end of the late season stage (Kc end). Table 12 lists typical values for Kc ini, Kc mid and Kc end for various agricultural crops. The coefficients presented are organized by group type (i.e., small vegetables, legumes, cereals, etc.) to assist in locating the crop in the table and to aid in comparing crops within the same group. There is usually close similarity in the coefficients among the members of the same crop group, as the plant height, leaf area, ground coverage and water management are normally similar. The coefficients in Table 12 integrate the effects of both transpiration and evaporation over time. The effects of the integration over time represent an average wetting frequency for a 'standard' crop under typical growing conditions in an irrigated setting. The values for Kc during the initial and crop development stages are subject to the effects of large variations in wetting frequencies and therefore refinements to the value used for Kc ini should always be made. For frequent wettings such as with high frequency sprinkler irrigation or rainfall, the values for Kc ini may increase substantially. TABLE 12. Single (time-averaged) crop coefficients, Kc, and mean maximum plant heights for non stressed, well-managed crops in subhumid climates (RHmin » 45%, u2 » 2 m/s) for use with the FAO Penman-Monteith ETo. 1 These are general values for Kc ini under typical irrigation management and soil wetting. For frequent wettings such as with high frequency sprinkle irrigation or daily rainfall, these values may increase substantially and may approach 1.0 to 1.2. Kc ini is a function of wetting interval and potential evaporation rate during the initial and development periods and is more accurately estimated using Figures 29 and 30, or Equation 7-3 in Annex 7, or using the dual Kcb ini + Ke. 2 Beans, Peas, Legumes, Tomatoes, Peppers and Cucumbers are sometimes grown on stalks reaching 1.5 to 2 meters in height. In such cases, increased Kc values need to be taken. For green beans, peppers and cucumbers, 1.15 can be taken, and for tomatoes, dry beans and peas, 1.20. Under these conditions h should be increased also. 3 The midseason values for cassava assume non-stressed conditions during or following the rainy season. The Kc end values account for dormancy during the dry season. 4 The Kc end value for potatoes is about 0.40 for long season potatoes with vine kill. 5 This Kc end value is for no irrigation during the last month of the growing season. The Kc end value for sugar beets is higher, up to 1.0, when irrigation or significant rain occurs during the last month. 6 The first Kc end is for harvested fresh. The second value is for harvested dry. 7 The Kc for asparagus usually remains at Kc ini during harvest of the spears, due to sparse ground cover. The Kc mid value is for following regrowth of plant vegetation following termination of harvest of spears. 8 Kc for sisal depends on the planting density and water management (e.g., intentional moisture stress). 9 The lower values are for rainfed crops having less dense plant populations. 10 The higher value is for hand-harvested crops. 11 The first Kc end value is for harvest at high grain moisture. The second Kc end value is for harvest after complete field drying of the grain (to about 18% moisture, wet mass basis). 12 If harvested fresh for human consumption. Use Kc end for field maize if the sweet maize is allowed to mature and dry in the field. 13 This Kc mid coefficient for hay crops is an overall average Kc mid coefficient that averages Kc for both before and following cuttings. It is applied to the period following the first development period until the beginning of the last late season period of the growing season. 14 These Kc coefficients for hay crops represent immediately following cutting; at full cover; and immediately before cutting, respectively. The growing season is described as a series of individual cutting periods (Figure 35). 15 Cool season grass varieties include dense stands of bluegrass, ryegrass, and fescue. Warm season varieties include bermuda grass and St. Augustine grass. The 0.95 values for cool season grass represent a 0.06 to 0.08 m mowing height under general turf conditions. Where careful water management is practiced and rapid growth is not required, Kc's for turf can be reduced by 0.10. 16 The pineapple plant has very low transpiration because it closes its stomates during the day and opens them during the night. Therefore, the majority of ETc from pineapple is evaporation from the soil. The Kc mid < Kc ini since Kc mid occurs during full ground cover so that soil evaporation is less. Values given assume that 50% of the ground surface is covered by black plastic mulch and that irrigation is by sprinkler. For drip irrigation beneath the plastic mulch, Kc's given can be reduced by 0.10. 17 Includes the water requirements of the shade trees. 18 These Kc end values represent Kc prior to leaf drop. After leaf drop, Kc end » 0.20 for bare, dry soil or dead ground cover and Kc end » 0.50 to 0.80 for actively growing ground cover (consult Chapter 11). 19 Refer to Eq. 94, 97 or 98 and footnotes 21 and 22 for estimating Kc for immature stands. 20 Stone fruit category applies to peaches, apricots, pears, plums and pecans. 21 These Kc values can be calculated from Eq. 98 for Kc min = 0.15 and Kc full = 0.75, 0.70 and 0.75 for the initial, mid season and end of season periods, and fc eff = fc where fc = fraction of ground covered by tree canopy (e.g., the sun is presumed to be directly overhead). The values listed correspond with those in Doorenbos and Pruitt (1977) and with more recent measurements. The midseason value is lower than initial and ending values due to the effects of stomatal closure during periods of peak ET. For humid and subhumid climates where there is less stomatal control by citrus, values for Kc ini, Kc mid, and Kc end can be increased by 0.1 - 0.2, following Rogers et al. (1983). 22 These Kc values can be calculated as Kc = fc Kc ngc + (1 - fc) Kc cover where Kc ngc is the Kc of citrus with no active ground cover (calculated as in footnote 21), Kc cover is the Kc, for the active ground cover (0.95), and fc is defined in footnote 21. The values listed correspond with those in Doorenbos and Pruitt (1977) and with more recent measurements. Alternatively, Kc for citrus with active ground cover can be estimated directly from Eq. 98 by setting Kc min = Kc cover. For humid and subhumid climates where there is less stomatal control by citrus, values for Kc ini, Kc mid, and Kc end can be increased by 0.1 - 0.2, following Rogers et al. (1983). For non-active or only moderately active ground cover (active indicates green and growing ground cover with LAI > about 2 to 3), Kc should be weighted between Kc for no ground cover and Kc for active ground cover, with the weighting based on the "greenness" and approximate leaf area of the ground cover. 23 Confers exhibit substantial stomatal control due to reduced aerodynamic resistance. The Kc, can easily reduce below the values presented, which represent well-watered conditions for large forests. 24 These coefficients represent about 40 to 60% ground cover. Refer to Eq. 98 and footnotes 21 and 22 for estimating Kc for immature stands. In Spain, Pastor and Orgaz (1994) have found the following monthly Kc's for olive orchards having 60% ground cover: 0.50, 0.50, 0.65, 0.60, 0.55, 0.50, 0.45, 0.45, 0.55, 0.60, 0.65, 0.50 for months January through December. These coefficients can be invoked by using Kc ini = 0.65, Kc mid = 0.45, and Kc end = 0.65, with stage lengths = 30, 90, 60 and 90 days, respectively for initial, development, midseason and late season periods, and using Kc during the winter ("off season") in December to February = 0.50. 25 These Kc's are for deep water in temperate latitudes where large temperature changes in the water body occur during the year, and initial and peak period evaporation is low as radiation energy is absorbed into the deep water body. During fall and winter periods (Kc end), heat is released from the water body that increases the evaporation above that for grass. Therefore, Kc mid corresponds to the period when the water body is gaining thermal energy and Kc end when releasing thermal energy. These Kc's should be used with caution. The values for Kc mid and Kc end in Table 12 represent those for a sub-humid climate with an average daytime minimum relative humidity (RHmin) of about 45% and with calm to moderate wind speeds averaging 2 m/s. For more humid or arid conditions, or for more or less windy conditions, the Kc coefficients for the mid-season and end of late season stage should be modified as described in this chapter. The values for Kc in Table 12 are values for non-stressed crops cultivated under excellent agronomic and water management conditions and achieving maximum crop yield (standard conditions). Where stand density, height or leaf area are less than that attained under such conditions, the value for Kc mid and, for most crops, for Kc end will need to be modified (Part C, Chapters 8, 9 and 10). Evapotranspiration during the initial stage for annual crops is predominately in the form of evaporation. Therefore, accurate estimates for Kc ini should consider the frequency with which the soil surface is wetted during the initial period. Where the soil is frequently wet from irrigation or rain, the evaporation from the soil surface can be considerable and Kc ini will be large. On the other hand, where the soil surface is dry, evaporation is restricted and the Kc ini will be small (Table 9). The value of Kc ini is affected by the evaporating power of the atmosphere, i.e., ETo. The higher the evaporation power of the atmosphere, the quicker the soil will dry between water applications and the smaller the time-averaged Kc will be for any particular period. As the amount of water available in the topsoil for evaporation and hence the time for the soil surface to dry is a function of the magnitude of the wetting event, Kc ini will be smaller for light wetting events than for large wettings. Depending on the time interval between wetting events, the magnitude of the wetting event, and the evaporation power of the atmosphere, Kc ini can vary between 0.1 and 1.15. A numerical procedure to compute Kc ini is provided in Annex 7. In general, the mean time interval between wetting events is estimated by counting all rainfall and irrigation events occurring during the initial period that are greater than a few millimetres. Wetting events occurring on adjacent days can be counted as one event. The mean wetting interval is estimated by dividing the length of the initial period by the number of events. Where only monthly rainfall values are available without any information on the number of rainy days, the number of events within the month can be estimated by dividing the monthly rainfall depth by the depth of a typical rain event. The typical depth, if it exists, can vary widely from climate to climate, region to region and from season to season. Table 13 presents some information on the range of rainfall depths. After deciding what rainfall is typical for the region and time of the year, the number of rainy days and the mean wetting interval can be estimated. Where rainfall is insufficient, irrigation is needed to keep the crop well watered. Even where irrigation is not yet developed, the mean interval between the future irrigations should be estimated to obtain the required frequency of wetting necessary to keep the crop stress free. The interval might be as small as a few days for small vegetables, but up to a week or longer for cereals depending on the climatic conditions. Where no estimate of the interval can be made, the user may refer to the values for Kc ini of Table 12. Estimate, from mean monthly rainfall data, the interval between rains during the rainy season for a station in a temperate climate (Paris, France: 50 mm/month), dry climate (Gafsa, Tunisia: 20 mm/month) and tropical climate (Calcutta, India: 300 mm/month). The crop coefficient for the initial growth stage can be derived from Figures 29 and 30 which provide estimates for Kc ini as a function of the average interval between wetting events, the evaporation power ETo, and the importance of the wetting event. Figure 29 is used for all soil types when wetting events are light. When wetting during the initial period is only by precipitation, one will usually use Figure 29 to determine Kc ini. The graph can also be used when irrigation is by high frequency systems such as microirrigation and centre pivot and light applications of about 10 mm or less per wetting event are applied. A silt loam soil receives irrigation every two days during the initial growth stage via a centre pivot irrigation system. The average depth applied by the centre pivot system is about 12 mm per event and the average ETo during the initial stage is 4 mm/day. Estimate the crop evapotranspiration during that stage. 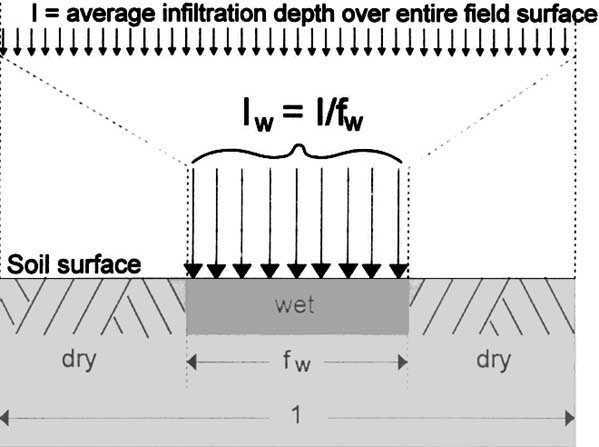 Figure 30 is used for heavy wetting events when infiltration depths are greater than 40 mm, such as for when wetting is primarily by periodic irrigation such as by sprinkler or surface irrigation. Following a wetting event, the amount of water available in the topsoil for evaporation is considerable, and the time for the soil surface to dry might be significantly increased. Consequently, the average Kc factor is larger than for light wetting events. As the time for the soil surface to dry is, apart from the evaporation power and the frequency of wetting, also determined by the water storage capacity of the topsoil, a distinction is made between soil types. Figure 30a is used for coarse textured soils and Figure 30b is used for fine and medium textured soils. Coarse textured soils include sands and loamy sand textured soils. Medium textured soils include sandy loam, loam, silt loam and silt textured soils. Pine textured soils include silty clay loam, silty clay and clay textured soils. I average infiltration depth [mm]. The values 10 and 40 in Equation 59 are the average depths of infiltration (millimetres) upon which Figures 29 and 30 are based. Small vegetables cultivated in a dry area on a coarse textured soil receive 20 mm of water twice a week by means of a sprinkler irrigation system. The average ETo during the initial stage is 5 mm/day. Estimate the crop evapotranspiration during that stage. The average crop evapotranspiration during the initial growth stage for the small vegetables is 3.0 mm/day. Kc ini (Tab Fig) the value for Kc ini from Table 12 or Figure 29 or 30. I the irrigation depth for the field [mm]. When irrigation of part of the soil surface and precipitation over the entire soil surface both occur during the initial period, fw should represent the average of fw for each type of wetting, weighted according to the total infiltration depth received by each type. Determine the evapotranspiration of the crop in Example 24 if it had been irrigated using a trickle system every two days (with 12 mm each application expressed as an equivalent depth over the field area), and where the average fraction of surface wet was 0.4, and where little or no precipitation occurred during the initial period. Therefore, one can interpolate between Fig. 29 representing light wetting events (~10 mm per event) and Fig. 30.b representing medium textured soil and large wetting events (~40 mm per event). This value (0.42) represents the Kc ini as applied over the entire field area. The average crop evapotranspiration during the initial growth stage for this trickle irrigated crop is 1.7 mm/day. Kc ini for trees and shrubs should reflect the ground condition prior to leaf emergence or initiation in case of deciduous trees or shrubs, and the ground condition during the dormancy or low active period for evergreen trees and shrubs. The Kc ini depends upon the amount of grass or weed cover, frequency of soil wetting, tree density and mulch density. For a deciduous orchard in frost-free climates, the Kc ini can be as high as 0.8 or 0.9, where grass ground cover exists, and as low as 0.3 or 0.4 when the soil surface is kept bare and wetting is infrequent. The Kc ini for an evergreen orchard (having no concerted leaf drop) with a dormant period has less variation from Kc mid, as exemplified for citrus in Table 12, footnotes 21 and 22. For 50% canopy or less, the Kc ini also reflects ground cover conditions (bare soil, mulch or active grass or weed cover). For rice growing in paddy fields with a water depth of 0.10-0.20 m, the ETc during the initial stage mainly consists of evaporation from the standing water. The Kc ini in Table 12 is 1.05 for a sub-humid climate with calm to moderate wind speeds. The Kc ini should be adjusted for the local climate as indicated in Table 14. Typical values for the crop coefficient for the mid-season growth stage, Kc mid, are listed in Table 12 for various agricultural crops. As discussed in Chapter 5, the effect of the difference in aerodynamic properties between the grass reference surface and agricultural crops is not only crop specific but also varies with the climatic conditions and crop height (Figure 21). More arid climates and conditions of greater wind speed will have higher values for Kc mid. More humid climates and conditions of lower wind speed will have lower values for Kc mid. The relative impact of climate on Kc mid is illustrated in Figure 32 where the adjustments to the values from Table 12 are shown for various types of climates, mean daily wind speeds and various crop heights. As an example, expected variations for Kc mid for tomatoes in response to regional climatic conditions are presented in Box 14.
h mean plant height during the mid-season stage [m] for 0.1 m < h < 10 m.
The Kc mid values determined with equations 62 and 65 are average adjustments for the midseason and late season periods. The values for parameters u2 and RHmin should be accordingly taken as averages for these periods (see example, Annex 8). The limits expressed for parameters u2, RHmin and h should be observed. Depending on the aridity of the climate and the wind conditions, the crop coefficient for wheat during the mid-season stage ranges from 1.02 (humid and calm wind) to 1.25 (arid and strong wind). Where the user does not have access to a calculator with an exponential function, the solution of the (h/3)0.3 expression can be approximated as [(h/3)0.5]0.5 where the square root key is used. RHmin is used rather than RHmean because it is easier to approximate RHmin from Tmax where relative humidity data are unavailable. Moreover, under the common condition where Tmin approaches Tdew (i.e., RHmax » 100%), the vapour pressure deficit (es - ea), with es from Equation 12 and ea from Equation 17, becomes [(100 - RHmin)/200] e°(Tmax), where e°(Tmax) is saturation vapour pressure at maximum daily air temperature. This indicates that RHmin better reflects the impact of vapour pressure deficit on Kc than does RHmean. 1 In the case of arid and semi-arid climates, Tmin in equation (64) should be adjusted as indicated in Annex 6 (equation 6-6) by subtracting 2°C from the average value of Tmin to better approximate Tdew. The values for u2 and RHmin need only be approximate for the mid-season growth stage. This is because Equation 62 is not strongly sensitive to these values, changing 0.04 per 1 m/s change in u2 and per 10% change in RHmin for a 3 m tall crop. Measurements, calculation, and estimation of missing wind and humidity data are provided in Chapter 3. Wind speed measured at other than 2 m height should be adjusted to reflect values for wind speed at 2 m over grass using Equation 47. Where no data on u2 or RHmin are available, the general classification for wind speed and humidity data given in Tables 15 and 16 can be used. Equation 62 is valid for mean plant heights up to 10 m. For plant heights smaller than 0.1 m, vegetation will behave aerodynamically similar to grass reference and eq. 62 should not be applied. Example values for h are listed in Table 12 for various crops. However, the mean plant height will greatly vary with crop variety and with cultural practices. Therefore, wherever possible, h should be obtained from general field observations. However, the presence of the 0.3 exponent in Equation 62 makes these equations relatively insensitive to small errors in the value used for h. Generally, a single value for h is used to represent me mid-season period. Kc mid is less affected by wetting frequency than is Kc ini, as vegetation during this stage is generally near full ground cover so that the effects of surface evaporation on Kc are smaller. For frequent irrigation of crops (more frequently than every 3 days) and where the Kc mid of Table 12 is less than 1.0, the value can be replaced by approximately 1.1-1.3 to account for the combined effects of continuously wet soil, evaporation due to interception (sprinkler irrigation) and roughness of the vegetation, especially where the irrigation system moistens an important fraction of the soil surface (fw > 0.3). Calculate Kc mid for maize crops near Taipei, Taiwan and near Mocha, Yemen. The average mean daily wind speed (u2) during the mid-season stage at Taipei is about 1.3 m/s and the minimum relative humidity (RHmin) during this stage averages 75%. The average u2 during the mid-season near Mocha is 4.6 m/s and the RHmin during this stage averages 44%. The average crop coefficient predicted during the mid-season stage is 1.07 for Taipei and 1.30 for Mocha. Typical values for the crop coefficient at the end of the late season growth stage, Kc end, and listed in Table 12 for various agricultural crops. The values given for Kc end reflect crop and water management practices particular to those crops. If the crop is irrigated frequently until harvested fresh, the topsoil remains wet and the Kc end value will be relatively high. On the other hand, crops that are allowed to senesce and dry out in the field before harvest receive less frequent irrigation or no irrigation at all during the late season stage. Consequently, both the soil surface and vegetation are dry and the value for Kc end will be relatively small (Figure 33). Where the local water management and harvest timing practices are known to deviate from the typical values presented in Table 12, then the user should make some adjustments to the values for Kc end. Some guidance on adjustment of Kc values for wetting frequency is provided in Chapter 7. For premature harvest, the user can construct a Kc curve using the Kc end value provided in Table 12 and a late season length typical of a normal harvest date; but can then terminate the application of the constructed curve early, corresponding to the time of the early harvest. h mean plant height during the late season stage [m], for 0.1 m £ h £ 10 m.
Equation 65 is only applied when the tabulated values for Kc end exceed 0.45. The equation reduces the Kc end with increasing RHmin. This reduction in Kc end is characteristic of crops that are harvested 'green' or before becoming completely dead and dry (i.e., Kc end ³ 0.45). No adjustment is made when Kc end (Table) < 0.45 (i.e., Kc end = Kc end (Tab)). When crops are allowed to senesce and dry in the field (as evidenced by Kc end < 0.45), u2 and RHmin have less effect on Kc end and no adjustment is necessary. In fact, Kc end may decrease with decreasing RHmin for crops that are ripe and dry at the time of harvest, as lower relative humidity accelerates the drying process. 1. Divide the growing period into four general growth stages that describe crop phenology or development (initial, crop development, mid-season, and late season stage), determine the lengths of the growth stages, and identify the three Kc values that correspond to Kc ini, Kc mid and Kc end from Table 12. 2. Adjust the Kc values to the frequency of wetting and/or climatic conditions of the growth stages as outlined in the previous section. 3. Construct a curve by connecting straight line segments through each of the four growth stages. Horizontal lines are drawn through Kc ini in the initial stage and through Kc mid in the mid-season stage. Diagonal lines are drawn from Kc ini to Kc mid within the course of the crop development stage and from Kc mid to Kc end within the course of the late season stage. Many crops grown for forage or hay are harvested several times during the growing season. Each harvest essentially terminates a 'sub' growing season and associated Kc curve and initiates a new 'sub' growing season and associated Kc curve. The resulting Kc curve for the entire growing season is the aggregation of a series of Kc curves associated with each sub-cycle. Figure 35 presents a Kc curve for the entire growing season constructed for alfalfa grown for hay in southern Idaho. In the southern Idaho climate, greenup (leaf initiation) begins in the spring on about day 90 of the year. The crop is usually harvested (cut) for hay three or four times during the growing season. Therefore, Figure 35 shows four Kc sub-cycles or cutting cycles: sub-cycle 1 follows greenup in the spring and the three additional Kc sub-cycles follow cuttings. Cuttings create a ground surface with less than 10% vegetation cover. Cutting cycle 1 is longer in duration than cycles 2, 3 and 4 due to lower air and soil temperatures during this period that reduce crop growth rates. The lengths for cutting cycle 1 were taken from the first entry for alfalfa (" 1st cutting cycle") in Table 11 for Idaho, the United States (10/30/25/10). The lengths for cutting cycles 2, 3 and 4 were taken from the entry for alfalfa in Table 11 for "individual cutting periods" for Idaho, the United States (5/20/10/10). These lengths were based on observations. In the southern Idaho climate, frosts terminate the growing season sometime in the fall, usually around day 280-290 of the year (early to mid-October). The magnitudes of the Kc values during the mid-season periods of each cutting cycle shown in Figure 35 vary from cycle to cycle due to the effects of adjusting the values for Kc mid and Kc end for each cutting cycle period using Equations 62 and 65. In applying these two adjustment equations, the u2 and RHmin values were averages for the mid-season and late season stages within each cutting cycle. Basal Kcb curves similar to Figure 35 can be constructed for forage or hay crops, following procedures presented in Chapter 7. Under some conditions, the user may wish to average the effects of cuttings for a forage crop over the course of the growing season. When cutting effects are averaged, then only a single value for Kc mid and a only single Kc curve need to be employed for the whole growing season. When this is the case, a "normal" Kc curve is constructed as in Figure 25, where only one midseason period is shown for the forage crop. The Kc mid for this total midseason period must average the effects of occasional cuttings or harvesting. The value that is used for Kc mid is therefore an average of the Kc curve for the time period starting at the first attainment of full cover and ending at the beginning of the final late season period near dormancy or frost. The value used for Kc mid under these averaged conditions may be only about 80% of the Kc value that represents full ground cover. These averaged, full-season Kc mid values are listed in Table 12. For example, for alfalfa hay, the averaged, full-season Kc mid is 1.05, whereas, the Kc mid for an individual cutting period is 1.20. Values for the crop coefficient during the mid-season and end of late season stages are given in Table 12. As mentioned before, the Kc values listed are typical values for standard climatic conditions and need to be adjusted by using Equations 62 and 65 where RHmin or u2 differ. As the mid and late season stages of deciduous trees are quite long, the specific adjustment of Kc to RHmin and u2 should take into account the varying climatic conditions throughout the season. Therefore, several adjustments of Kc are often required if the mid and late seasons cover several climatic seasons, e.g., spring, summer and autumn or wet and dry seasons. The Kc ini and Kc end for evergreen non dormant trees and shrubs are often not different, where climatic conditions do not vary much, as happens in tropical climates. Under these conditions, seasonal adjustments for climate may therefore not be required since variations in ETc depend mostly on variations in ETo. From the crop coefficient curve the Kc value for any period during the growing period can be graphically or numerically determined. Once the Kc values have been derived, the crop evapotranspiration, ETc, can be calculated by multiplying the Kc values by the corresponding ETo values. Weekly, ten-day or monthly values for Kc are necessary when ETc calculations are made on weekly, ten-day or monthly time steps. A general procedure is to construct the Kc curve, overlay the curve with the lengths of the weeks, decade or months, and to derive graphically from the curve the Kc value for the period under consideration (Figure 36). Assuming that all decades have a duration of 10 days facilitates the derivation of Kc and introduces little error into the calculation of ETc. The constructed Kc curve in Box 15 was used to construct the curve in Figure 36. This curve has been overlaid with the lengths of the decades. Kc values of 0.15, 1.19 and 0.35 and the actual lengths for growth stages equal to 25, 25, 30 and 20 days were used. The crop was planted at the beginning of the last decade of May and was harvested 100 days later at the end of August. For all decades the Kc values can be derived directly from the curve. The value at the middle of the decade is considered to be the average Kc of that 10 day period. Only the second decade of June, where the Kc value changes abruptly, requires some calculation. An example application for using the Kc procedure under average soil wetness conditions is presented for a dry bean crop planted on 23 May 1974 at Kimberly, Idaho, the United States (latitude = 42.4°N). The initial, development, mid-season and late season stage lengths are taken from Table 11 for a continental climate as 20, 30, 40 and 20 days (the stage lengths listed for southern Idaho were not used in this example in order to demonstrate the only approximate accuracy of values provided in Table 11 when values for the specific location are not available). Initial values for Kc ini, Kc mid and Kc end are selected from Table 12 as 0.4, 1.15, and 0.35. As Kc end = 0.35 is less than 0.45, no adjustment is made to Kc end. The value for Kc mid is not significantly different from that in Table 12 as u2 » 2 m/s, RHmin is just 15% lower than the 45% represented in Table 12, and the height of the beans is relatively short. The initial Kc curve for dry beans in Idaho can be drawn, for initial, planning purposes, as shown in the graph (dotted line), where Kc ini, Kc mid and Kc end are 0.4, 1.19 and 0.35 and the four lengths of growth stages are 20, 30, 40 and 20 days. Note that the Kc ini = 0.4 taken from Table 12 serves only as an initial, approximate estimate for Kc ini. Constructed Kc curves using values from Tables 11 and 12 directly (dotted line) and modified using Kc ini from Fig. 29 and Lini = 25, Ldev = 25, Lmid = 30, and Llate = 20 days (heavy line) for dry beans at Kimberly, Idaho. Also shown are daily measured Kc (lysimeter data from Wright, 1990). Kc ini can be more accurately estimated using the approach described in this chapter. ETo during the initial period at Kimberly (late May - early June, 1974) averaged 5.3 mm/day, and the wetting interval during this period was approximately 14 days (2 rainfall events occurred averaging 5 mm per event). Therefore, as the wetting events were light (< 10 mm each), Fig. 29 is used. The soil texture at Kimberly, Idaho is silt loam. From Fig. 29, Kc ini for the 14 day wetting interval and ETo = 5.3 mm/day is about 0.15. This value is substantially less than the general 0.4 value suggested by Table 12, and emphasizes the need to utilize local, actual precipitation and irrigation data when determining Kc ini. Because the ETc data for the dry bean crop at Kimberly, Idaho were measured using a precision lysimeter system during 1974 by Wright (1990), the actual Kc measurements can be compared with the constructed Kc curves, where actual Kc was calculated by dividing lysimeter measurements of ETc by daily ETo estimated using the FAO Penman-Monteith equation. As illustrated in the graph, the mid-season length as taken from Table 11 for the general, continental climate overestimated the true mid-season length for dry beans in southern Idaho, which averaged only about 30 days rather than 40 days as suggested by Table 11. 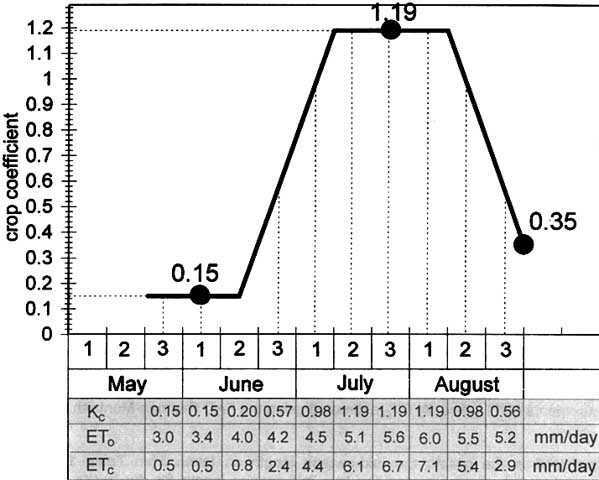 This illustrates the importance of using the local observation of 30 days for mid-season period length rather than the general value from Table 11. The final, best estimate for the Kc curve for the dry bean crop in southern Idaho is plotted (lower curve in graph) using Kc values of 0.15, 1.19, and 0.35 and the actual observed lengths of growth stages equal to 25, 25, 30 and 20 days. Note the impact that the error in estimating mid-season length has on the area under the Kc curve. This supports the need to obtain local observations of growth stage dates and lengths. The value calculated for Kc mid (1.19) appears to have underestimated the measured value for Kc during portions of the mid-season period at Kimberly. Some of this effect was due to effects of increased soil water evaporation following four irrigations during the 1974 mid-season which increased the effective Kc. This is illustrated in Box 16, where the basal Kcb + Ke approach is introduced and demonstrated for this same example. The 0.15 value calculated for Kc ini using Fig. 29 agrees closely with measured Kc during the initial period. Measured Kc during the development period exceeded the final Kc curve during days on or following wetting events. The day to day variation in the lysimeter measured Kc is normal and is caused by day to day variations in weather, in wind direction, by errors in prediction of Rn and ETo, and by some random errors in the lysimeter measurements and weather measurements. first five days of that decade, Kc = 0.15, while during the second part of the decade Kc varies from 0.15 to 0.36 at the end of day 10. The Kc for that decade is consequently: 5/10 (0.15) + 5/10(0.15+0.36)/2 = 0.20. S (Lprev) sum of the lengths of all previous stages [days]. Equation 66 applies to all four stages. Determine Kc at day 20, 40, 70 and 95 for the dry bean crop (Figure 36). The crop coefficients at day 20, 40, 70 and 95 for the dry bean crop are 0.15, 0.77, 1.19 and 0.56 respectively. Kratio conversion factor (1.0... 1.3). h = 0.5 m is the standard height for the alfalfa reference. The values for Kc mid and Kc end listed in Table 12 are for a large part based on the original values presented in FAO Irrigation and Drainage Papers No. 24 and 33 (FAO-24 and FAO-33), with some adjustment and revisions to reflect recent findings. Similarly adjustments in Kc mid to compensate for differences in aerodynamic roughness and leaf area, as introduced in Equation 62 are derived from the Kc values given for different wind and RHmin conditions in the concerned Kc table in FAO-24, with some upward adjustment to better reflect increased ETcrop values under high wind and low RHmin when applied with the FAO Penman-Monteith equation. The Kc's from FAO-24 were based primarily on a living grass reference crop. The FAO Penman-Monteith equation presented in this publication similarly represents the same standardized grass reference. For that reason Kc values are in general not very different between these publications except under high wind and low RHmin. The No. 24 modified Penman was found frequently to overestimate ETo even up to 25 % under high wind and low evaporative conditions and required often substantial local calibration (see chapter 2). Kc values derived from crop water use studies which used the FAO-24 Penman equation to compute grass reference crop evapotranspiration, can therefore not be used and need to be adjusted using ETo values estimated from the FAO Penman-Monteith equation. Similarly crop water requirement estimates based on the FAO-24 Modified Penman equation will need to be reassessed in view of the found differences between the FAO-24 Penman and the FAO Penman-Monteith reference equations.